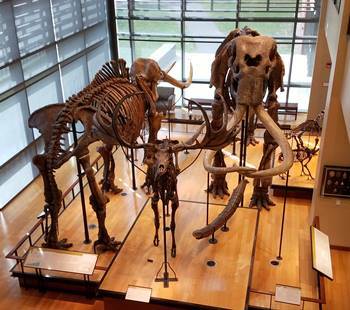 The Beneski Museum of Natural History is located on the campus of Amherst College in Amherst, Massachusetts. 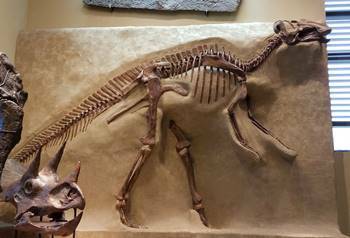 Although the museum is not well known nationally, it has a terrific collection of fossils, specializing in ancient mammals with some dinosaur highlights, including the greatest collection of dinosaur tracks on planet Earth. 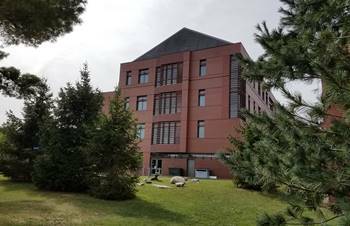 Amherst is a great college town, and one of highlights is the Beneski Museum of Natural History (BMNH) located in the Beneski Earth Sciences Building on the Amherst College campus. Before I arrived, I was mainly interested in going to this museum to see the terrific collection of dinosaur tracks contained in the Edward Hitchcock Ichnology Collection. Hitchcock was one of the first American professors interested in hunting for evidence of ancient animals. His collection of fossilized dinosaur tracks and footprints housed at the museum is the premier collection in the world. Hitchcock gathered hundreds of slabs of tracks from up and down the Connecticut River Valley, some from right near Amherst, others from as far as a couple hundred miles away. I couldn’t wait to see them! The main highlight of the museum is the almost unbelievable collection of dinosaur footprints and tracks contained in the Edward Hitchcock Ichnology Collection. This huge collection, the world’s largest, was compiled over thirty years by Hitchcock, a geologist that later became the president of Amherst College. He started publishing about his collection in 1836, six years before the word “dinosaur” was even coined by Sir Richard Owen in England. 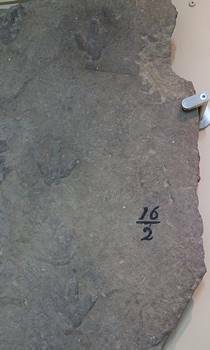 The first known specimen of dinosaur tracks ever collected was at that time referred to as “Noah’s Raven,” discovered in 1802 by a young man named Pliny Moody at a farm in the area. It was then the belief that these fossilized bird-like tracks must have been preserved after the biblical flood. These tracks are on display at BMNH, and many, many more slabs full of tracks hang on the walls in the room housing the collection. The “Noah’s Raven” track is the earliest known discovery of a dinosaur fossil in North America. The “Noah’s Raven” dinosaur tracks found in 1802 by Pliny Moody. Beneski Museum of Natural History, Amherst College, Amherst, MA. The tracks in the collection range in size from tiny to very large, and they likely represent over 100 different species of dinosaur. 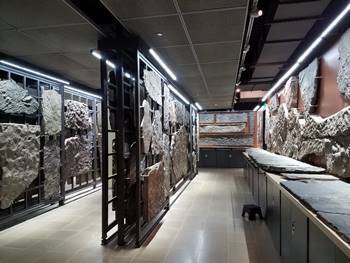 The entire collection houses over 1200 separate slabs of dinosaur tracks, and includes over 21,000 individual footprints. 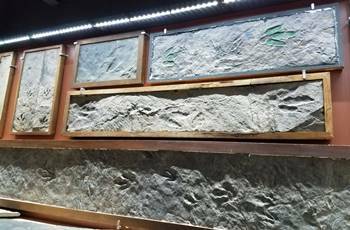 The room in which they are displayed is quite spectacular: the modern displays of these ancient tracks are very well done–visitors can easily see a huge variety of well-preserved footprints up close. Many of the slabs are framed; I thought it was nice that BMNH had a footstool available for visitors to stand on to get a really close look at the tracks and easily see the ones that were high up on the wall. Dinosaur tracks drew me to the Beneski Museum, but there was plenty more there to keep my interest, starting with a few great dinosaur fossils. Amherst College had a very active paleontology program during the first golden age of dinosaur fossil hunting, and many of their finds from the 1920’s and before are displayed here. One beauty is a relatively small Gryposaurus skeleton, collected by famed paleontologist Charles M. Sternberg. Gryposaurus was a hadrosaur, a family commonly known as duck-billed dinosaurs. The fossil mount is posed as science understood these animals back in the 1920’s more so than today, in which case the Gryposaurus would be posed with its tail more erect and legs directly under the middle of the body. Once thought to be a slow, lumbering animal, more recent studies of hadrosaurs indicate that they were actually quite fast and agile. Next to the Gryposaurus is a relatively small but beautiful fossil Triceratops skull that was discovered during an Amherst College expedition to Montana in 1929. There are also bones from various dinosaurs including leg and foot bones from a Diplodocus, and a cast of a Tyrannosaurus skull. BMNH is one of the few museums I have seen which displays a cast of Compsognathus, a small carnivorous dinosaur about the size of a chicken. There are also casts of two different Archaeopteryx specimens. 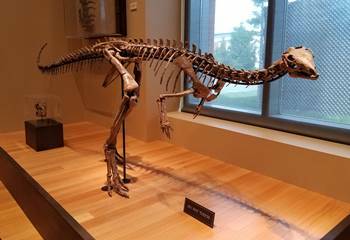 One of the best finds at the BMNH is a much smaller dinosaur, a plant-eating ornithopod from the Jurassic called Dryosaurus. The skeleton on display is a juvenile, and is one of the most complete specimens of this dinosaur. The skull is amazing; it is remarkably complete for such a small dinosaur and is the best example of this animal anywhere. Dryosaurus was small but probably very fast, which was undoubtedly its best defense against the predators of its time which included Allosaurus and Ceratosaurus, among others. While the dinosaur tracks are amazing and the dinosaur collection is very interesting at BMNH, my favorite highlight of the museum is the amazing prehistoric mammal collection. After you visit the dinosaurs, take the nearby stairs down to see some terrific fossils. 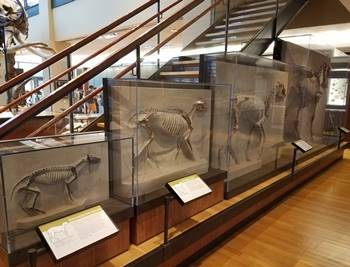 Right in front of the stairway is a large wall full of mammal fossil mounts, which include specimens of nine different mammals collected during various Amherst College expeditions to Wyoming, South Dakota and Nebraska during the early 20th century. The large barrel-chested Brontops, a distant relative of rhinos and horses, stands at the bottom. Others include the ancient bear dog Daphoenus, the small rhino Menoceras, and a giraffe and camel relative named Oxydactylus. The mounts are very well done and are an impressive welcome to the lower floor of the museum. Another terrific collection from Amherst’s paleontological history is displayed on the other side of the stairway. Four separate cases show the evolutionary history of the horse, a native of North America. The first is a very small ancient horse called Eohippus (the “dawn horse”), which dates to about 54 million years ago (mya). The second mount is that of Mesohippus, a slightly larger horse that dates to the Oligocene epoch, approximately 33 mya. Next to it is a much larger relative, the Merychippus, a Miocene horse dating to about 15 mya. It is interesting to compare these ancient horses to the modern Equus, standing in the last case in the display. The evolution of horses, Beneski Museum of Natural History, Amherst College, Amherst, MA. 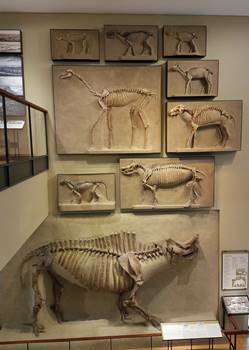 There are plenty of other fossils to see at BMNH. I enjoyed a display of three Merycoidodon fossil skeletons that came from an Amherst expedition. This small ancient mammal is a family favorite ever since my father-in-law and oldest son found a lower jaw of one of these animals (which dates to about 33 mya) when they went for a hike through some Oligocene-age outcrops in western Nebraska. Merycoidodon probably looked like a small pig-like sheep. They were widespread across the region, and fossils have been found all over North America. Another type of prehistoric fossil at BMNH that has been found in western Nebraska is the Daemonelix, or “Devil’s Corkscrew,” a spiral screw-like form of hardened earth that was created by a burrowing ancient beaver called Palaeocastor as it used its incisors to create a tunnel to live in. Quite a few of these tunnels have been found near Agate Fossil Beds National Monument in Harrison, Nebraska. Other highlights at BMNH include several large ancient mammals: one beautiful display features a mammoth, a mastodon, an ancient bear, a dire wolf, and the great sabertooth cat Smilodon. Nearby is a mount of an animal not often seen in museums–the gazelle-like camel Stenomylus. Given their distribution today, it is perhaps surprising that camels are actually native to North America, having spread to Asia and North Africa after evolving over millions of years on this continent. Another nice feature at BMNH is a system of cabinet drawers that can be pulled out to reveal various fossils and casts of dinosaurs, mammals, and ancient sea creatures like trilobites, ammonites, and crinoids. There were a lot of pleasant surprises in the drawers, that’s for sure. I also enjoyed some fossils displayed in a glass case at the back of the display area. A cast of the armored skull of Dunkleosteus, a giant fish from the Devonian period sits near a beautiful Edaphosaurus, a herbivorous sailback reptile from the Permian period. While the collection of dinosaur tracks drew me to visit the Beneski Museum of Natural History, I ended up spending a lot more time than I thought I would looking at other displays. The fossil mammal collection is particularly impressive; few museums display as many ancient mammals, and quite a few of those at BMNH are terrific specimens. The museum does a really good job explaining the history of Amherst College’s paleontology expeditions through numerous educational displays and signs accompanying the fossils, and the Beneski Museum is a great showcase for this history! If you’re not interested in dinosaurs, dinosaur footprints, or ancient mammals, you will probably not have a great time at the BMNH. The museum is located inside an active campus teaching and research building; other than the fossils and tracks in the museum, there really isn’t anything for the public to do. Amherst is a terrific college town though, and there are plenty of great restaurants and shopping opportunities available nearby. The Beneski Museum of Natural History is a wonderful museum that I would highly recommend. It is hard to complain about anything at a museum that does not charge admission! For all these great things, though, I will say that it is not terribly easy to find. There is virtually no signage leading visitors to the museum, and the building itself is very nice but you would not know there was a museum inside until you get right up to the building. It must be pointed out that there is no nearby parking for visitors to the museum. Check their website for more information before you visit; getting a campus map and figuring out where you might park will make it a lot easier to see this wonderful museum! Unfortunately I was not able to take my children on my visit to the Beneski Museum. The BMNH regularly welcomes school groups who come to marvel at the dinosaur footprints and some of the great fossil mounts. Other than the tracks and fossils, I didn’t see any specific areas designed for younger children, and because the museum is located in an active teaching building, it is important that visitors are quiet. While I visited, a fairly large class from Amherst College made their way through the exhibit hall as their professor pointed out various fossils. When the class ended, quite a few of the students remained to check out more displays in the museum, I think they were as pleasantly surprised as I was!